Big style, Big robots, Big action, Big-O! While the first Japanese animators were heavily influenced by Disney and the American style, it seems that in the past few decades, anime makers have seen anything worth emulating in the American market. And who could blame them. The only good American cartoons of the 80's and early 90's were made in Japan anyway. The recent boom of Cartoon Network and Nickelodeon cartoons is further proof that funny voices and barnyard animals getting beat up is all that it takes to impress American toon-watchers. The one American show that really stands out as a masterpiece of story, art, and motion is Batman: The Animated Series. 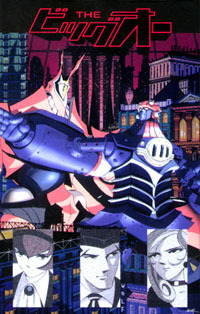 Now, the Japanese animation house responsible for animating that American show have crossed the Batman mythology with retro giant robots to create the most American-friendly anime in years: The Big-O! The first tape is just one 25 minute episode long, but it's one of the best. The series begins with the hero, Roger the Negotiator, exchanging ransom money for blindfolded girl. Thanks to a remote-control rocket powered briefcase, Roger manages to get the girl, and take the money back from the kidnapper, Mr. Gold. Soon afterwards, we learn that the girl is actually an android. She becomes the Robin to Roger's Batman, (although the girl in Small Miracle might be a better comparison). Shortly afterwards, Roger is informed by his Alfred-in-an-eye-patch butler that a bank robbery is being committed by a giant tentacled robot. Now we learn that Roger isn't just a suave negotiator, but can also control the giant robot, Big-O! After leaving his trusty limo (which has shields EXACTLY like the Batmobile), Roger jumps into Big-O and battles with his huge power-fists. But who's controlling the evil robot? This mystery carries over into the next episode, giving us two battles against the same robot. The next few episodes introduce a potential love interest for Roger, a perpetually pink-clad secret agent, and a couple new villains. The villains have Batman potential, but are never given enough depth to make them that memorable. The giant robots are all very unique, with everything from mummies to dragons used as inspiration. This kind of variety in robot design makes the battles much more interesting than the standard punch and shoot battles that we see so much of. The stories in The Big-O are reminiscent of Batman in that there's a new or recurring villain, a mystery to uncover to find out what the villain's up to, and a final showdown. While small elements carry over from episode to episode, it's primarily an episodic show, not a single storyline. There are many mysteries left open that I am very curious to learn more about, such as what happened to the city to leave it in ruins, and where did the Big-O come from, but these will have to wait... indefinitely. You see, the biggest problem with The Big-O is that it was cut short without an ending. You really get into the show and are dying for more, then it just ends. No resolution, no sense of conclusion. As far as I know the series is finished with no plans for more episodes. This is a shame, as the show had such incredible potential for a long-term story arch. Imagine if Batman just went 13 episodes before WB moved on to Superman. Would Batman still be rerun 7 days a week 10 years after its release? I don't think so. Big-O had that kind of lasting potential, and for some reason, Sunrise cut it off in its prime. The manga series is still running with the third tankubon just released. Perhaps they will carry on the story there. The animation in The Big-O is top notch; incredibly smooth throughout, it features better quality artwork than Batman, but less frames of movement (Those lazy Japanese love to show the backs of people's heads during conversation!). The pacing is slower than Batman, too, with lots of stylish driving shots and panoramic views breaking up the action. The backgrounds are very detailed, but are mostly ruined skyscrapers. Character designs are very retro, looking like a cross between Batman and Giant Robo. I especially appreciate the creativity the designers showed with hair. The Big-O has one of the most pleasant soundtracks in a long time. It's kind of jazzy like Cowboy Bebop, but more simple and relaxing. Action music is more orchestral, and comic moments have their own unique themes. The theme is ripped straight from the music of Queen with a Bohemian Rhapsody opening and Flash Gordon rip-off for the rest. It's very fun, and goes well with the flash animation-like opening segment. The ending theme is a romantic vocal number, soft and pretty. I watched the original, unsubbed Japanese releases, but even though I don't know much Japanese, I found the stories fairly easy to follow. The characters are pretty iconic, and most of the story is devoted to Roger solving a problem and fighting a robot, so it doesn't take a genius to keep track of who's who. The Japanese tapes are wonderfully packaged, each tape containing a pamphlet describing characters and vehicles. Perhaps some of the pamphlets explain the mysteries I mentioned before, but as I read only the tiniest fraction of Japanese, I guess I'll never know. The Big-O will almost certainly be picked up for US distribution, and don't be surprised if it shows up on American TV. If you're a fan of Giant Robots, you can't miss The Big-O. A wonderful anime for its short run, you will only be disappointed with the premature ending.